Santa Barbara:: The American Riveria is unscathed – Go! Recent reports clear any fears of travel holds to Santa Barbara. The air is clear – the entire is city open for business and the sun is shining on our sparkling jewel. I am heading down to spend time on the waterfront – see you there! Santa Barbara—the American Riviera®—offers a captivating blend of history, distinctive architecture and Southern California lifestyle in a breathtaking setting of glorious palm-lined beaches, majestic mountain ranges and bucolic wine country. A city of white-washed buildings with red tile roofs tucked between the mountains and the sea, Santa Barbara resonates with an irresistibly sensuous and laid-back allure. Set on the Pacific with 100 miles of sweeping coastline, Santa Barbara and its environs lie just 92 miles north of Los Angeles and 332 miles south of San Francisco. Visitors may arrive via scenic Highway 101, daily stops on Amtrak or via air service to Santa Barbara Airport or Los Angeles International Airport. Santa Barbara County offers 168 diverse lodging options, ranging from deluxe resorts and stylish boutique hotels to romantic inns and rustic guest ranches. 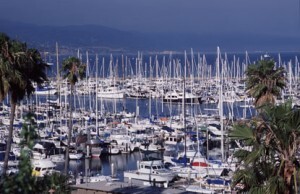 Visit www.santabarbaraCA.com for visitor information. I grew up in Santa Barbara and although fire reports scare many tourists away, it is very rare that they come down far enough to affect any of the coastal hotels or tourist areas. I don’t live in Santa Barbara anymore and miss it terribly, I definitely suggest to anyone who hasn’t been to go check it out. It has something for everyone – beautiful scenery, relaxing white sand beaches, renowned hiking trails, and great shopping, restaurants, and wine. For the budget traveler who wants to see all that luxurious Santa Barbara has to offer but can’t afford some of the ritzier hotels, the Sandman Inn (www.sandmaninn.com) is a gem. It’s a quaint hotel in a prime location, and is less touristy than some of the other spots. It’s a great value for a very nice hotel. Have fun on your travels!